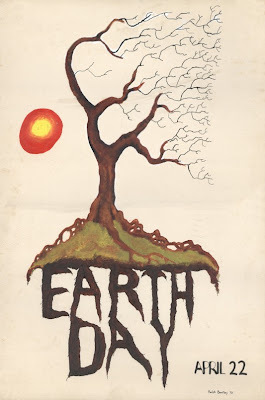 This is an Earth Day poster I made in my High School art class, in 1970, for the first Earth Day. It is painted on a beige, pebbled-finish mat board. I painted the tree using acrylics, and added details with my Rapidograph pen (remember those?). What is interesting about this painting was that I used some kind of correction white on it, thinking I would fix it later (completely white out the background or something). Yeah right. Later. I didn't realize it would be almost 40 years later using some then undreamed-of technology. In 1970 an average computer took up half a small building. On Earth Day 2009, I scanned the thing, and used a "clone brush" tool in a paint program to eliminate the white-out. It's done now. Yeah, this is the Earth Day Poster I made in my High School art class in 1970. For the first Earth Day. Did that kid have a future in graphic design or what?